In this new piece aimed at ages seven and over, the harrowing and disorientating experience of being forced from your home by conflict and into another country, is made tenderly comprehensible for young minds. There are a quartet of performers onstage, playing mother, father and two young daughters – but while the parents carry a silent sadness they try to shield their children from, the youngest daughter mourns their old life through flights of fantasy into memories. Created by Jabuti Theatre, in collaboration with Vision Mechanics and Platform Glasgow, Paper Memories is gently-paced and focused in particular upon the physical movement of the four performers (Helen Parke, Nathan Johnston, Jusztina Hermann and director Rachael Macintyre). Through visually arresting expressive dance sequences, we get a sense of the family's loss, and the togetherness they feel in this time of crisis. When their youngest child's memories of home explode into life, however, it's with a sense of anarchic fun and some visually arresting puppet work. She imagines a flock of chickens in the farmyard, one racing free around the auditorium; a beloved pet rabbit, formed from various parts brought on by her family; and the songbird she used to call, and which she now believes in vain might travel across oceans to see her again when she whistles. The carefully sculpted paper puppetry of these creatures lends a fantastical air, and the silk acrobatics of the two sisters are a striking extra attraction, particularly for young minds. 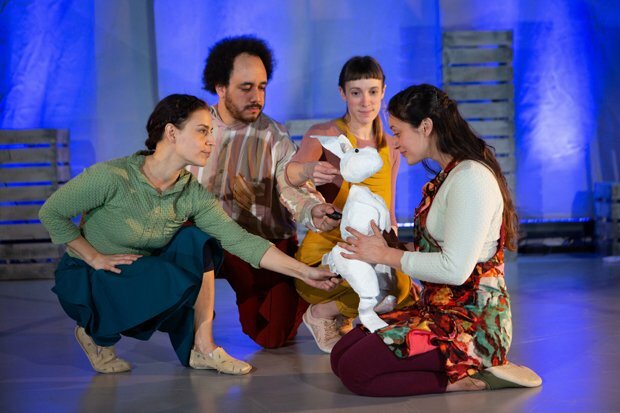 Although Mariem Omari's play is short on words – and therefore useful for a multilingual audience – both it and the precision of the company's performances create a work which transcends its roots in the ugly politics of our time to say something deep and lasting to children about grief. Reviewed at Howden Park Centre, Livingston, Tue 9 Apr. Jabuti Theatre’s Paper Memories introduces the themes of migration, identity and the power of memories, through various art forms, to children age 7+. Frozen Charlotte's hard-hitting but engaging new show for teenagers and adults shines a light on childhood poverty.